Proven results with H2Flo: less water use and better yield! Located near St Andrews, in Scotland, the Alanhill Farming Company grows 65ha of quality field-grown strawberries. For continuity of supply, from May to September, they grow Elsanta, Sonata and Malling Centenary under Spanish and Cozy tunnels. The majority of production is on medium loam soil, while one site has a lighter sandy soil. “The crops are fed via a single drip tape” explains Tom Wood, soft fruit manager. “While this delivers water to the centre of the bed, we struggled to get it into the shoulders - which is far from ideal. While rooting was very good in the bed centre, the roots were not being sufficiently encouraged to spread out to the shoulders. Roots that did make it out showed signs of poor development or had even died”. 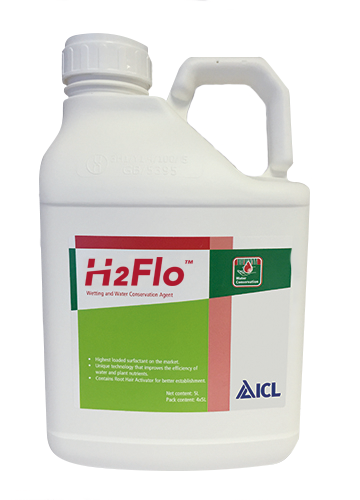 Working with ICL’s agronomist advisors, in 2014 Allanhill took the decision to trial H2Flo - the new wetting and conservation agent which helps solves issues across a spectrum of soil types. Mixed in to the feeding tank it was initially applied at 1.2l/ha and then monthly at 0.6l/ha. ient supply to the roots means the plant is able to work efficiently – this of course translates into improvements in quality and yield”. “If plants become water stressed it can heighten disease problems and lead to small fruit. By using H2Flo we are confident that we are giving the crop the best chance to perform to its full potential. Although we have not done measurements on water savings, extra yield or product quality we feel that we are getting an improvement in both yield as quality”. Impressed by the results, Tom and his team adopted H2Flo across all 65ha of production last year and will be using as standard this coming season.